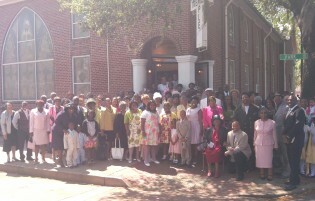 The Sanctuary Choir renders traditional gospel music during worship services. The membership of the Sanctuary Choir shall consist of individuals from all choirs who have accepted Jesus Christ as their Lord and Savior and possess a desire to serve God through a traditional gospel and hymnal music ministry. Rehearsal for the Sanctuary Choir is held the Thursday before the 4th Sunday of every month at 7 pm.